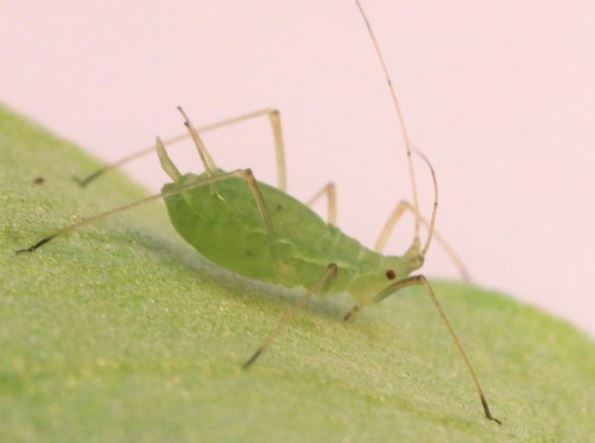 PEA aphids – a serious agricultural pest – have the ability to see and avoid a common, aphid-killing bacteria on plant leaves, according to a new Cornell University study published in Current Biology. Pea aphids lack immune-response genes, making them highly susceptible to infection. In the lab, pea aphids that became infected with virulent strains of the bacteria all died. They make up for their immune deficiency by reproducing in large numbers but can still die from bacterial infection at a high rate. It turns out the bacteria (Pseudomonas syringae), and all members of the genus Pseudomonas, contain compounds called pyoverdine, which bind iron, but also fluoresce in ultraviolet (UV) light – wavelengths that exist in sunlight. Furthermore, pea aphids can distinguish the unique blue-green light that virulent strains of P. syringae emit. The findings have implications for pest control. For example, organic farmers could spread pyoverdine or virulent P. syringae on leaves to deter pea aphids, though more study is needed to test the effectiveness of these strategies. “Aphids are vectors of plant diseases – they transfer viral diseases – and that’s one of their major economic impacts,” Cornell University assistant professor of microbiology and one of the paper’s lead authors, Tory Hendry, said. While studying the effects of bacteria on aphids, Hendry and her colleagues noticed aphids would rarely eat an artificial sap with virulent P. syringae mixed in. More tests revealed the aphids, when given food choices, consistently avoided feeding when virulent P. syringae was in the food. Using faba bean leaves, which have two leaflets separated by stems, the researchers painted one leaflet with a solution mixed with bacteria and the other without bacteria, as a control. They tested different strains of bacteria, some benign, others virulent. When pea aphids were released at the base of the plants, they preferred the control leaves and avoided the leaves with some bacterial strains. “It was correlated with virulence; they avoided the more virulent strains and not the lesser strains,” Hendry said. Previous studies of aphids had shown that they exhibited colour preferences, and prior research showed the bacterial species in the genus Pseudomonas fluoresce. “That got me thinking that maybe vision is important, we could take assays and actually do them in the dark,” Hendry said. The team conducted similar tests under UV light-blocking plastic, and the aphids fed normally on all the leaves, including those with deadly bacteria. In another experiment, the researchers used a mutant form of virulent P. syringae that doesn’t make the fluorescent compound, pyoverdine. The pea aphids ate from the bacteria-laden leaves, and died. More experiments, using different designs to test whether aphids avoided the fluorescing deadly bacteria, all consistently showed the same result. Co-lead author Russell Ligon, a postdoctoral researcher at the Cornell Lab of Ornithology, who studies sensory ecology and visual modeling, took leaves with P. syringae bacteria on them and measured light that reflected off them to figure out what colours they emitted. His investigations revealed the virulent bacterial strains that pea aphids avoided were more blue than other more benign strains, within ranges aphids should see based on their blue, green and UV optical cones. “The colours aphids are best at detecting actually match up perfectly with the colour of fluorescence that the [virulent] bacteria produce,” Hendry said. Future research will explore if bacteria or pyoverdine by itself deter aphids from settling on plants. They also plan to study the evolution of this trait by looking at different aphid species and how they interact with virulent P. syringae. Co-authors include Rachel Fay, a former student in Hendry’s lab through the Microbial Friends and Foes Research Experiences for Undergraduates program through the Plant Pathology and Plant-Microbe Biology, while she was an undergraduate at State University of New York at Potsdam; Kevin Besler, a former lab technologist in Hendry’s lab; and Melanie Smee, a postdoctoral research associate.